The MPL4212 is a low cost quad serial interface built around the HD6350 from HITACHI. 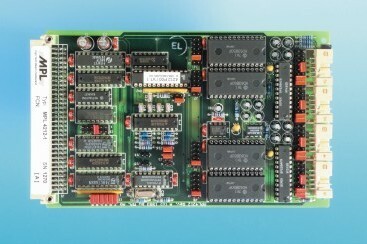 The board contains four identical serial channels with the possibility of selecting individual baud rates for each channel. All the serial I/O lines are compatible with the RS232-C standard and are available on four identical connectors on the front of the PCB. Because of its on board DC/DC converter there is no need to provide an external ±12V supply for the serial driver. Normal access to the board is made via the synchronous VPA space. It is fully compatible with the G-64/96 bus. The MPL4212 supports vectored interrupts in synchronous and asynchronous cycles as well as auto vectored interrupts. In the vectored mode there is the possibility to supply one vector which is identical for all channels or four vectors, one for each channel. Through the careful implementation of full CMOS technology the MPL4212 consumes only 40mA at +5V.